You work hard to save money, but is your money working hard enough for you? You wouldn’t expect to go to work and give a poor performance, so why do you put up with lackluster effort from your money? Leaving your hard-earned cash in a savings account may be safe, but over time, inflation will erode your pay cheque. Historically, inflation is usually higher than the interest you earn from a deposit account. Not knowing how to grow their wealth is what holds most people back. 60% of respondents in our global Emerging Affluent Survey believe that financial education will help them reach their financial goals faster. It’s not enough just to save your money. To grow your wealth, you have to invest. Although investments go through ups and downs, they can be potentially more rewarding over the longer term, beating the rate of inflation. Because not all asset classes perform consistently across time, diversifying across asset classes and markets helps reduce volatility, balancing risk and returns. If one investment performs poorly over a certain period, other investments may perform better over the same time, reducing potential losses. If you prefer not to bother with choosing which asset classes or markets to invest in, invest in mutual funds or exchange-traded funds that are already diversified across markets and asset classes. 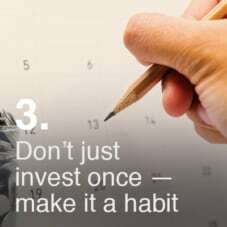 Develop the habit of investing regularly by automating your investments. 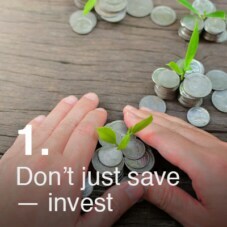 One way to achieve this is through a Regular Savings Plan, where you can automatically transfer funds from your savings account and invest in selected funds every month. You will also enjoy the benefit of dollar-cost averaging, which rides out the highs and lows of the market. 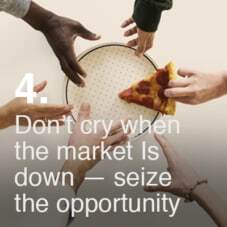 A market correction refers to a price decline of at least 10%. Not only are market corrections normal, they can create some of the best opportunities to increase the potential for returns and minimize the potential for losses by making stocks cheaper relative to their earnings potential. Investment for many people is a bit like writing a will, they know they have to do it but find it difficult to address the need or make the commitment to doing it. 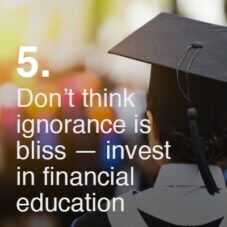 The biggest barrier to investing is lack of knowledge. Our research has shown that globally 49% of those we surveyed only use savings products – despite having the money to invest. So it’s important to get advice from the experts, to ensure your money works as hard as you do. If you do not have the time nor the patience to dig deep into the details, you can learn the basics e.g. What is a mutual fund? 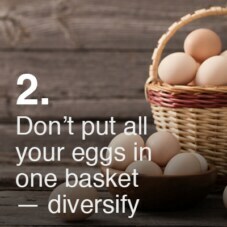 What does diversification mean? From educational articles and supplement it with expert financial advice from a trusted financial advisor. This article is for general information only and it does not constitute an offer, recommendation or solicitation to enter into any transaction. This article has not been prepared for any particular person or class of persons and it has been prepared without regard to the specific investment or insurance objectives, financial situation or particular needs of any person. You should seek advice from a licensed or an exempt financial adviser on the suitability of a product for you, taking into account these factors before making a commitment to purchase any product. In the event that you choose not to seek advice from a licensed or an exempt financial adviser, you should carefully consider whether the product is suitable for you. You are fully responsible for your investment decision, including whether the Online Trading service is suitable for you. The products/services involved are not principal-protected and you may lose all or part of your original investment amount.